by Major J. N. Blashford-Snell, M.B.E, F.R.G.S, R.E. Jeremy Groves of 17/21 st Lancers sent the signal 'Mission Accomplished' from the Cape Horn area. a huge lorry blocking the way. The Rocky Mountains had presented some challenging drives on roads from which vertical drops of thousands of feet descended into rushing, boulder-strewn rivers. 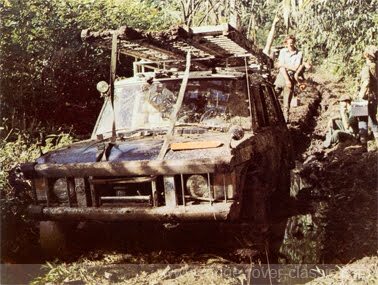 In Mexico they met desert conditions and in Guatemala the Pan Americas highway became a rutted track. They beat the jungles and swamps of Darien and climbed up into the high Andes. 90 mph on a straight desert road. 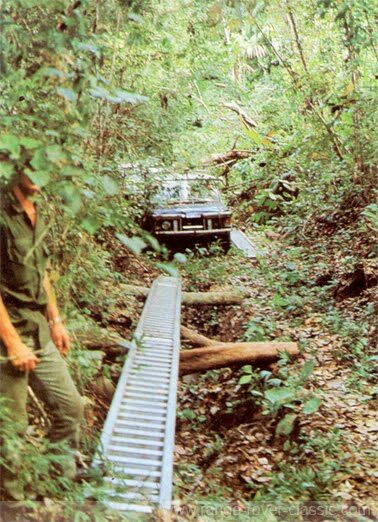 In the Darien Gap they only averaged 3 miles in a day! As they neared their goal they hit snow and ice once more. Many mountain passes were blocked and it took five long days to break through this last obstacle belt. On one occasion they had to cross a lake on a very Heath Robinson local raft to avoid the blocked passes. One can imagine the feeling of achievement as the drivers gazed at Cape Horn and switched off their engines after seven months and 18,000 miles. 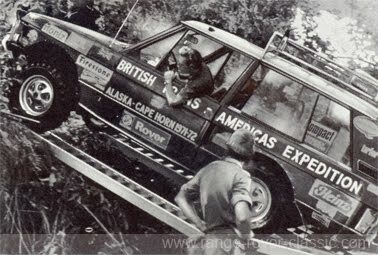 The Expedition’s aim was to focus attention on the need to complete the 18,000 mile Pan American Highway, connecting North and South America, by taking motor vehicles from Alaska to Tierra del Fuego. At present it is blocked by this notorious ‘Tapon del Darien’. gash in the hull of one pontoon. Like a whaler's longboat the piragua, or Indian canoe, with which we had been towing the raft across a fast flowing river, was now dragged backwards by the stricken grey 'whale'. One man was still aboard, the raft commander, Sgt. Major David Wright of the Royal Engineers, boat expert and formerly a helmsman on the Blue Nile. Already my Panamanian boatman, Canito, instantly realising what must be done, had sliced through the tow rope with his sharp machete. Somehow the raft was still upright. Men were struggling in the water, clearly visible by their bright red life jackets. Down-stream the great raft spun, but by a miracle it seemed the serious-faced raft commander was winning control and as we watched he rammed the wreck into a shingle bank. Most survivors had reached the river's edge and were clinging on to the trees, few had the strength to climb out: they had been working for hours in the blistering heat and for some every step, with their feet raw from 'jungle foot', was agony. With his usual skill Canito swung the 30ft long boat around and we picked them up. Some laughed nervously, some grinned, others looked very shaken and in spite of a shade temperature of over 80°F, they shivered. Thank God everyone was safe, even the vehicle had been saved; but the raft ripped open by a rock was crippled and would need much work before it could continue. and zoology of the region. Medical and veterinary subjects as well as the Indians were also studied. British Trans-Americas Expedition Committee under the energetic Chairmanship of Lt. Col. Julian du Parc Braham was formed in 1970. Experienced explorers and travellers in this wild land were asked to consider whether such a project was feasible. Most people considered it was sheer folly, especially as several other well-prepared expeditions had failed. 5 women from Britain and America joined some 40 Panamanian soldiers and 30 Colombian servicemen in central America in early January 1972. Operation Darien, as it was known, had begun. Air support consisted of a British Army Beaver aircraft, plus helicopters from the United States Air Force and the Air Forces of Panama and Colombia. Medium range transport aircraft and light reconnaissance planes also helped us. 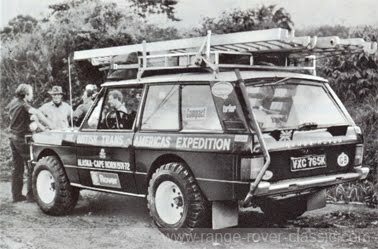 they were to be joined later by a Land Rover pathfinder, which we purchased in Panama. 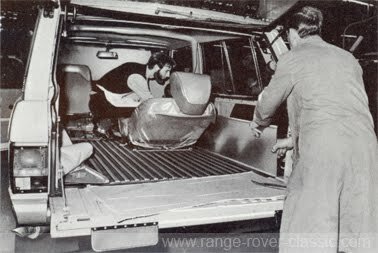 The Range Rovers with six men as their crew went on to complete the drive from Alaska, which they left in early December 1971, to Tierra del Fuego, which they reached in June 1972. 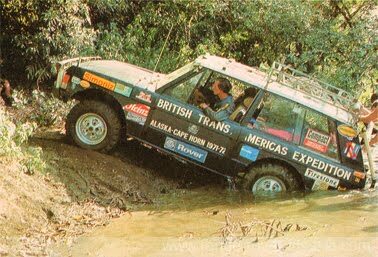 The Land-Rover, having completed its task as a pathfinder, has now been flown back to Panama and given to the Guardia Nacional. of vampire bats and blood suckers, but the strong kept going and enabled the Expedition to advance. enveloping nightdress. Alas, Cromwell, attired in this garb, broke loose one night and disappeared into the jungle. Later, he was found by Indians who had been indulging in an all-night drinking party. On sighting this terrible pink apparition they took to their heels and fled, believing it to be an ancestor come to reprimand them for their drinking. However, the expedition went to the rescue. Cromwell was disrobed and the Indians were allowed to keep him in the interests of good relationships. cold morning air, the roar of that powerful engine taking us up and above our base camp. Now for the first time I was seeing the Darien Gap, one of the most difficult and dangerous places in the world. the Beaver once again. Now the grassland was patchier; the green darkened and thrust up towards us. A mist that had lain in 'sausage' shaped clouds at tree top level began to clear. parallel to the great waterway." The true shape of our enemy now showed, but from 500ft it still looked oddly innocuous, the ridges that rose steeply beside us were forested, but on the plateau between, the trees that stood out most were widely scattered. All rose straight trunked, some carrying umbrellas of foliage at their tops, others white and dead looking. Their branches were like spread fingers reaching up to us. We dropped to have a closer look. I glanced at the altimeter. It still read 400ft, yet we seemed almost to be brushing the tallest trees. I looked again at the green carpet around their base and realised the truth. What we had been looking at was merely the primary jungle; the real problem lay below it. The most prominent trees must have been up to 150ft high. They rose out of undergrowth so thick that even from a modest height, it looked solid. This secondary jungle flourished where the tallest trees were sparse and let the sun in. Although it seemed like shrubbery, what we could see were the tops of lesser trees. We climbed to 1,500ft and headed for the northernmost of the two mountain ranges that flank the of each vehicle. over the ridges that blocked our path. We made a tight turn to take a photographic run, I found myself clutching a Polaroid camera tightly to avoid it being sucked out of the open window. In the back of the aircraft, Peter Marett, my Information Officer, quickly processed the film as I handed the camera back to him after each shot, at the same time he was making copious notes, using a special Tandberg tape recorder and watching the countryside flash past. Our eyes searched the ground for any sign of a track. There was none. The hills did not appear from the air to be too steep, but once you got low you could realise that they were not going to be an easy task. 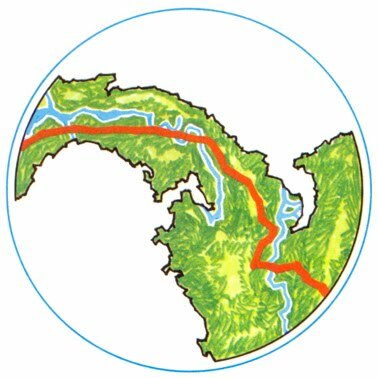 The problem was to recognise the smaller features, such as rivers, which twisted and turned under the green canopy. There were very few villages shown on the map although we saw the occasional houses dotted along the river banks. 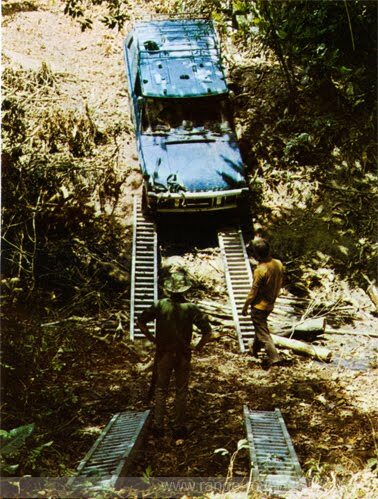 One of my main tasks in the reconnaissance was to discover the best place to cross the Bayano river. We flew up and down the river line until our fuel was almost exhausted. Several points looked possible but all would require rafting and the current was by no means slack. 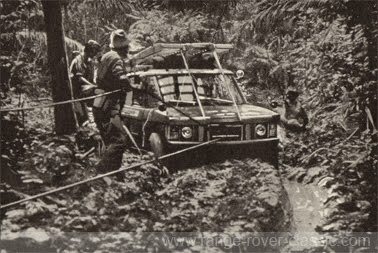 Once we saw a track deep in sticky black mud leading to the river. So this was to be it. We turned for home and landed, deep in thought. available began to fall apart. The mosquitoes, gnats and flies became a constant plague ..."
and stores in Canitos. It was still raining as, drenched to the skin, we loaded the horses on 19 January. 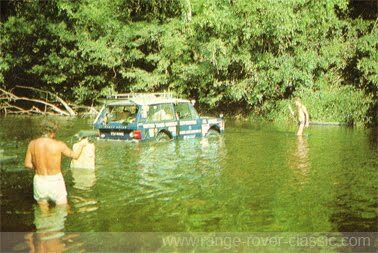 The recce party had warned us by radio that the track ahead was thick with mud and bisected by steep sided ravines, but we could wait no longer for three months was really very little time to reach the far end of the Gap anyway. So, for the first three days we marched in terrible conditions through the heat and mud of the open pastureland. At night we camped with our hammocks slung between the trees, cooking on damp wood fires. As yet the mosquitoes were not a plague but, nevertheless, we always hung nets above our beds. Each day we marched on a little bit further into the forest. Meanwhile outside the Gap the scientific team were working in their own areas, some of them coming in from day to day to visit us. Through the jungle we moved in a long straggling column. Our prison, for that is what it was, was illuminated by a dull green light, which at times gave an almost translucent appearance to this eerie world. Great trees rose up like pillars reaching for the sun, which beat down on the canopy some 150ft above. Lianas and vines hung down in a tangled mass to catch projecting horse loads and to trip the unwary. The ground was a mat of leaves constantly being re-supplied from above. Underneath we found a layer of humus, from which grew thick undergrowth. 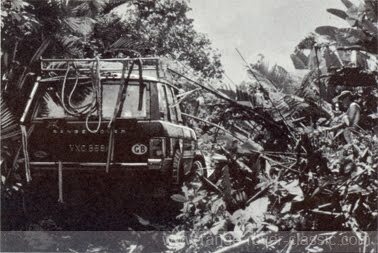 Visibility was rarely more than 30 metres and all the time, day and night, the jungle resounded to the drip, drip, drip of the condensed humidity and the occasional crash of some giant tree falling at the end of its life. When the rain came it usually fell in torrents, turning the track into an instant quagmire. The thick black mud, ravines, gullies and dense jungle were augmented by the fast flowing rivers, patches of poisonous palms and stinging plants. All these problems combined against us. It was easy to see how the ill-fated Scots colony that was established on the coast of Darien in 1699 had perished from disease and hunger. Our sweat-soaked clothes rotted on us. Leather equipment grew mould, even the best jungle boots available began to fall apart. The mosquitoes, gnats and flies became a constant plague; there were inch-long black ants whose bite hurt like hell for hours, there were also stinging caterpillars and, in the rivers, electric eels. The heat and humidity were oppressive and even the nights brought little relief. Clusters of aggressive and vindictive hornets nested in hollow trees and swarmed out to meet anyone who disturbed them. I have never seen insects so vicious. Within seconds a well-ordered column could turn into chaos under attack from hornets. One of the girls became seriously ill when she developed an allergic reaction to one such assault. Inch-wide centipedes and black scorpions also took their toll, whilst spiders as large as dinner plates were fearsome to behold. When brushing against the foliage we constantly picked up ticks that, almost unnoticed, buried their teeth into one's flesh with such tenacity that they often had to be removed by the medical officer. If the head remained in the skin it became a constant source of irritation. On the other hand, snakes, although numerous, were usually shy and it was not until later in the expedition that we came across more aggressive varieties. 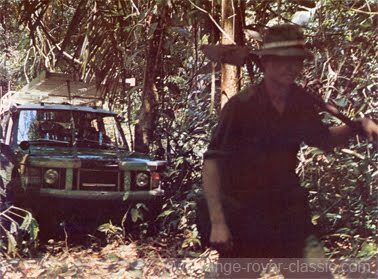 The larger animals were rarely dangerous and on one occasion a recce party came face to face with a beautiful black panther on the jungle track. There were other cats such as ocelot and margay and, surprisingly, large deer. have had little effect on the concentrated rush of these ugly-tempered creatures and on one occasion they completely wrecked a camp, scattering the terrified horses into the jungle. Not surprisingly our Sunday services were well attended and with Keith Morgan-Jones as choirmaster, the Sappers, who loved to sing, would give throaty renderings of 'Guide me, 0 Thou great Redeemer' and other appropriate hymns. The 25 Royal Engineers of our team were commanded by a veteran explorer, Captain Jim Masters. He had been one of the most important men in the conquest of the Blue Nile in 1968 and had also played a leading part in the Dahlak Quest expedition two years later. Army mountaineer, Captain Richard Summerton, who in 1970 climbed Annapurna, was one of the reconnaissance and re-supply officers. of the 7th Gurkha Rifles. The Hon Charles Keyes, grandson of the famous Admiral, was an interpreter and navigator. There were also soldiers from the 17th/21st Lancers, Royal Artillery, Royal Signals, Infantry, Army Air Corps and REME. up the steep and slippery slopes. before once again disappearing into the jungle in their quest for knowledge. in mid-April. 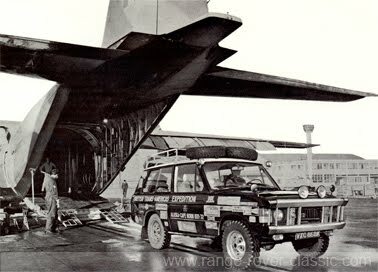 We purchased a second-hand Land-Rover in Panama for use as a pathfinder vehicle and it was flown out in the belly of a giant United States Air Force helicopter. Its purpose was to support the leading Engineer section, which, under the command of veteran obstacle breaker Captain Ernie Durey, RE, was pressing ahead with all speed. The climate and pace were beginning to tell. In fact, throughout the whole expedition more than 30 members had to be evacuated by helicopter, light aircraft or boat, because of illness. Our doctor and his energetic SRN wife Suzie fought a constant battle to keep us fit. To maintain the momentum we employed large numbers of local people and Indians; which added considerably to our costs. 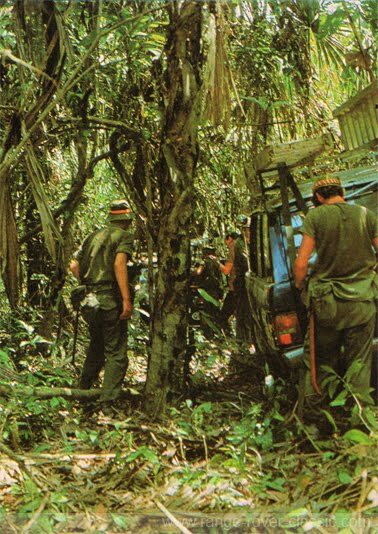 With their long machetes these hard-working men continued to hack through the jungle. Navigation was always difficult and from time to time we became lost in spite of our Indian guides. 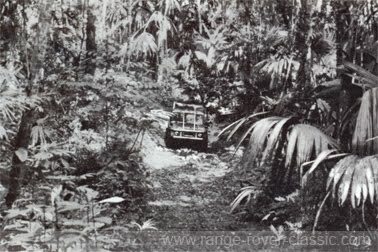 deep in the jungle took all the skill the army pilots had. Members of the Expedition had been picked for their compatibility, physical fitness and expertise. I planned to form a team rather than a group of prima donnas. However, as our problems increased and the going became more difficult the inevitable minor squabbles and signs of nervous exhaustion more common in mountaineering, became apparent. The girls rose high in our estimation, for in spite of living under the same trying conditions as the men and being expected to work the same hours, do guard at night, pull the horses through the mud, push boats up rivers and beat off the hordes of insects, they retained their good humour, rarely complained and always looked smart. Indeed, they added tone and often brought commonsense to cool down a heated argument. huge Bushmaster which reared up behind him. It struck twice but each time by good fortune Sgt Limbu was taking a pace forward for his next swing at the vegetation and each time the snake missed him. Behind Limbu there was a Colombian cutter called Ruby who spoke no English and no Gurkhali. Limbu spoke no Spanish and therefore Ruby's timely warning went unheeded. However, he raced up and pinned the reptile down with a large forked branch. Even so he could not manage to hold it. Now Limbu saw the danger and spun around to despatch his attacker. Although the British Trans-Americas Expedition could not be called the most hazardous of operations, there was always danger around the corner. And on the last day we almost lost the lives of two men who were returning to Turbo with the Colombian gun boat. They were working on the raft which was tied alongside the gun boat, which in turn was moving at approximately five knots. Suddenly something must have hit the front of one of the inflatable boats, for without warning the bow of the raft doubled up and water swept over the whole construction. Both men were hurled into the river and sucked under the ship. They found themselves bumping along the rusty, flat hull and suddenly being spun with enormous force by the propeller. Fortunately the gun boat had lost a propeller the previous week and now only had one, which definitely increased their chances of survival. Nevertheless, they were extremely fortunate to be hurled out into the wake of the gun boat, having lost all their clothes and watches. With only superficial bruises and cuts they were hauled aboard the ship and congratulated on their lucky escape. The Expedition rations had been designed specially for the project by the Ministry of Defence and were very good. Other food was provided by numerous kind sponsors. In addition, to economise and to vary the diet, we ate local dishes, which included jungle fruit, iguana, fish, monkey, snake and wild turkey. The climate, which was usually between 90 and 100°F with 85 per cent humidity, led one to long for fresh, crisp, salads, but the dehydrated food, especially the sliced apple, was a fine substitute. "We were two weeks behind schedule and the promised rains began. It was a desperate race to cross the remaining 60 kilometres that no motor vehicle had crossed before." Although water had caused difficulties for much of the journey, eventually the lack of it became a problem and thus we had to resort to slicing open vines and drinking from them or filtering the water from slimy pools, or having our own delivery by parachute. 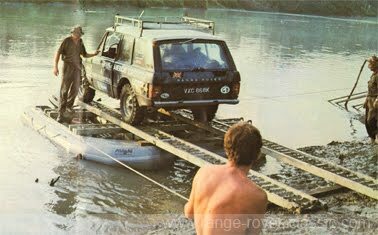 of the low level of the water, but occasionally when we reached deep pools a raft was called in and used to ferry the cars to the next shallow water. 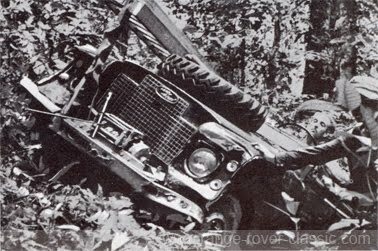 By this method all three cars were able to find a way around the obstruction and reached the old smuggler's trail on the eastern side of the Tuira valley after climbing some extremely steep hills. At last we reached the frontier at Palo de la Letras, a broken concrete plinth on a jungle-covered hill top. This was our summit and now we were going downhill. Half a mile from the plinth, on the Panamanian side, we found a rusting red car, a sad reminder of the ill-fated Chevrolet expedition that had reached the frontier over 10 years ago, and then turned back. Now it lay, a rotting hulk with trees growing up through the engine compartment and an ants nest in the boot. As we poked sticks into the interior a venomous coral snake slithered from beneath the remains of the back seat and a large black spider emerged from the dashboard. boat became our floating HQ. It was in Colombia that a great tragedy occurred. Whilst setting out to join the expedition a reconnaissance party of six Colombian servicemen and our Liaison Officer, Captain Groves, were travelling in a small tin boat. After leaving Turbo Harbour the boat capsized in a heavy sea and sank within 15 seconds. The only survivors were a Colombian officer and Jeremy Groves. To our horror we heard that the remaining five Colombians had been drowned or sucked down in the mud of the mangrove swamp that fringed the shore nearby. Nevertheless, our Colombian friends produced another team within a matter of days and continued to support us wholeheartedly until the very end. So on 10 April the Expedition HQ was established for the last time. By coincidence it stood on a 'peak in Darien' looking out, not across the Pacific, but over the steaming green morass of the Atrato swamp. We were two weeks behind schedule and the promised rains began. It was a desperate race to cross the remaining 60 kilometres that no motor vehicle had traversed before. somewhat shaken, very wet and rather smelly. the area. 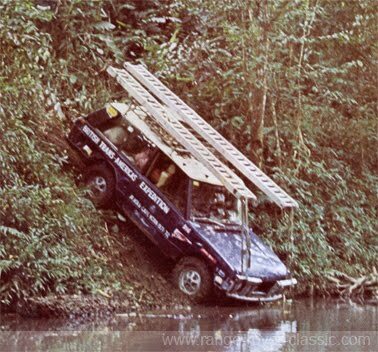 We were told by engineers and surveyors that they had lowered a drum full of concrete on a wire into the swamp and at 1,000ft they had not yet reached firm bottom. Many parts of this incredible area looked solid, but one day when landing from a float-fitted helicopter I climbed gingerly out onto the surface. Immediately the area within 10 or 15ft of me gave slightly and I had the wobbly feeling which I imagine one would get from standing on a giant blancmange. On 23 April the sun set with its usual livid orange glow and as it did so a party of ragged, filthy men and women, mules and vehicles, emerged on the far side of the vast bog. Their eyes were hollow and their faces drawn, their bodies were a mass of bites and sores and their feet were in an indescribable condition due to an ailment called immersion foot, but somehow as they staggered up, dragging, heaving and pushing their vehicles on to the northern end of the southern section of the Pan American Highway, they managed to smile. After 99 days in the jungle and swamps of Darien, we had broken through. It was St George's Day. and in many respects more difficult. When I compare this with the jungles of Borneo and Malaya, I find the Darien jungle to be infinitely worse'. The project had been the most ambitious expedition ever undertaken by the British Army and many times during the journey we found it hard to believe that we could win, but still we pressed on. Indeed, it has been an incredible adventure, accomplished by determination, flexibility, excellent equipment and good practical engineering, coupled with the generous help of all the sponsors and governments concerned. may now be changed for ever. indicates that the worst was yet to come. 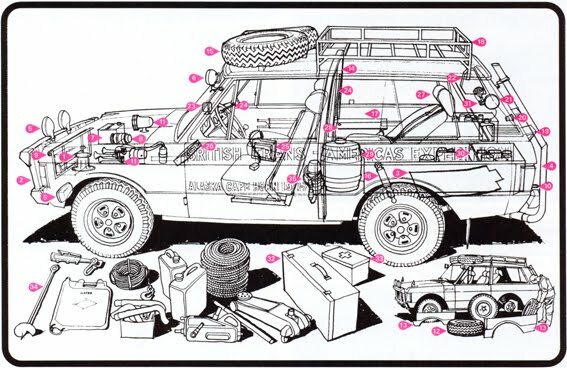 20 Power point in rear of vehicle for cooker etc.